Russell Westbrook is the most volatile great player in NBA history. Russell Westbrook can embarrass a whole team with his explosive play. Sometimes that team is his own. Russell Westbrook may be the most important person remaining in the NBA playoffs. 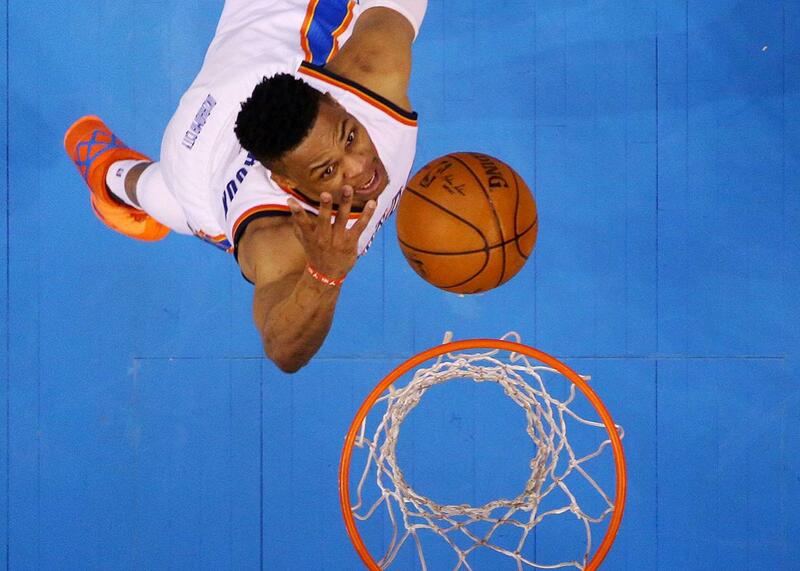 Above, Westbrook in Game 3 of the Western Conference Finals at Chesapeake Energy Arena in Oklahoma City, Oklahoma, May 22, 2016. In the third quarter of Sunday night’s Game 3 of the Western Conference Finals, with his Oklahoma City Thunder beating the Golden State Warriors by a shocking 34 points, Russell Westbrook zipped a bounce pass between his legs on a fast break. The play was stunning in the moment and even more so on replay: the sheer, flamboyant beauty of it, the look on Westbrook’s own face, as though even he can’t believe what he’s seeing. In a game the Thunder won 133–105, and one in which at many points they seemed to out-Warriors the Warriors, that play felt perfectly microcosmic, of both the game itself and the man who made it. Never mind that Westbrook’s teammate Randy Foye failed to convert the basket. (He was fouled.) Dwelling on such a detail feels almost vulgar, as it so often does in the Russell Westbrook experience. Westbrook may be the most important person remaining in the NBA playoffs: more important than his teammate, Kevin Durant; more important than Stephen Curry; more important than walking deity LeBron James; more important, even, than Drake. If Westbrook plays as well as he’s capable of playing, the Thunder might very well win the NBA title. If Westbrook plays as erratically as he’s capable of playing, the Thunder will assuredly come up short, and sooner rather than later—there is no team in NBA history more likely to come back from a 2–1 series deficit than the 2015–16 Warriors. Russell Westbrook is the most volatile truly great player the NBA has ever seen, a man who can swing wildly between being the most dominant and most detrimental figure in any game he’s playing in. James aside, Westbrook is the most physically talented player in the NBA, a guard with the vertical explosiveness of Jordan and Kobe and the speed and quickness of Iverson or Chris Paul, while physically stronger than any of them. Basketball writer and esteemed Westbrookologist Bethlehem Shoals once likened his play to “shooting craps in an abandoned missile silo,” a perfect image of thrilling unpredictability and looming violence. My favorite genre of Westbrook highlight is the breathtaking coast-to-coast rampage, such as this one from a game against Philadelphia last year, in which he takes the inbounds pass and simply outruns three Sixers before dunking on the remaining two. Westbrook is capable of embarrassing an entire team on a single possession. Unfortunately, sometimes that team is his own. Westbrook can make basketball look incredibly easy, but he can also make the game needlessly difficult, for himself and his teammates. He is a gifted and at times dominant defender who’s also an inveterate gambler, blowing up his own team’s defensive schemes by jumping recklessly into passing lanes. On offense he is egregiously turnover-prone and shoots far more three-pointers than he should, if he should be shooting any at all: Among players with more than 1,500 attempts, Westbrook has the third-worst three-point percentage of all time. A clichéd and usually silly criticism of star basketball players is that they “disappear,” an accusation that’s been lobbed in some variation at nearly every great player at some point in his career (including Kevin Durant). Russell Westbrook barely ever disappears; if only he were better at occasionally disappearing. There is a wonderful basketball colloquialism for the approach to the game that is Westbrook’s undoing: “hero ball.” Hero ball is, essentially, a style of play in which one player takes it upon himself to be the lead actor, at every turn. Imagine the kid playing alone in his driveway shooting endless imaginary buzzer-beaters as he screams out “3 … 2 … 1,” then place that kid in a context where he actually has teammates, and you start to get the idea. We want our basketball players to be heroes, but the last thing we want is for them to play hero ball. The 2014–15 Thunder season practically demanded hero ball. With Durant missing a total of 55 games, including the final 28, Westbrook transformed into a one-man fantasy team. There was a 49-point, 15-rebound, 10-assist triple-double in early March, followed by a 43-8-7 line the very next night; a few weeks later he added a 36-10-15, then a 40-11-13 shortly after that. In the third-to-last game of the season, Westbrook scored a career-high 54 points in a loss to the Indiana Pacers. When the season ended, the Thunder were left out of the playoffs after losing a tiebreaker to New Orleans; Russell Westbrook led the NBA in field goal attempts despite having missed 15 games (nearly 20 percent of the season) due to injury and shot the third-worst percentage of his career. This year, Westbrook had perhaps the best all-around season of his career. He averaged 23.5 points, 10.4 assists, and 7.8 rebounds while racking up a 27.64 player efficiency rating and finished fourth in the league’s MVP voting. He posted 18 triple-doubles, the most in 34 years. With Durant back on the floor Westbrook embraced his co-pilot role with renewed intensity if not always flawless execution. OKC’s current postseason success is coming mostly because of Westbrook but still sometimes in spite of him. In the playoffs, he’s averaging 25.3 points, 11.1 assists, and 6.4 rebounds, but he is also turning the ball over more than four times a night, shooting 41 percent from the field (including 32 percent from three), and still taking 5.6 three-pointers per game. Off the court Westbrook can come off as prickly and aloof, as well as a bit of a bully. But he’s also incredibly smart and one of the rare athletes who seems genuinely funny, at least when he wants to be. He is a notoriously outré dresser, and the overall impression is of someone who is considerably more eclectic and interesting than the average NBA superstar. One gets the sense that Westbrook plays the way he does not out of a sense of insane competitiveness, à la first-ballot hero ball Hall of Famer Kobe Bryant, but rather because if he didn’t, playing basketball for a living might just start to bore him. It’s a typically Westbrookian conundrum that the greatest damage to his image was done by the greatest blessing to his basketball career: the fact that he’s spent his time in the NBA playing alongside Kevin Durant. Durant is probably one of the few players in the league who’s better than Westbrook (although that’s debatable), but more than that, Durant is everything Westbrook isn’t. He’s tall and long, all grace and finesse, a cool stoic who glides across the court eviscerating defenses like a samurai. He’s one of the most beautiful shooters the sport has ever seen, a player whose lightning-quick release and not-quite-Curry-but-close range make him a perfect fit for this spacing-happy era of the NBA. He’s also a player whose modest demeanor and amiable quietude have made him a perennial favorite of the basketball media. Durant’s plastic affability makes Westbrook look molten and surly by comparison, and these are precisely the things a point guard is not supposed to be. The health of Durant and Westbrook’s relationship has been the subject of near-constant speculation over the years, although they insist they get along great, and I’m inclined to believe them. They are an odd couple, though, and there has always been an unavoidable urge to speculate on what their lives would be like without each other. The future of the Durant-Westbrook union has been looming over the Thunder for years, and never more ominously than right now. While ESPN’s Marc Stein reported during the previous round that the Thunder organization felt confident that a conference finals appearance would be enough to convince Durant to re-sign for at least another year or two, the impending free agent has made no such declarations. It’s still possible that if the Thunder collapse and lose this series, it could trigger a domino effect in which Durant leaves town and suddenly Westbrook, who’s a free agent in 2017, could be on the move as well. It’s hard to imagine him anywhere else. It’s also hard to imagine him doing anything so obvious as staying put. We’re still playing craps in the silo, and Russell Westbrook is holding the fate of the franchise in his hands, like a pair of dice.